I wanted to share an interesting website that seeks to document what makes games fun and addictive. The author Yu-Kai Chou describes and groups lots of common techniques that you will have seen in different games. 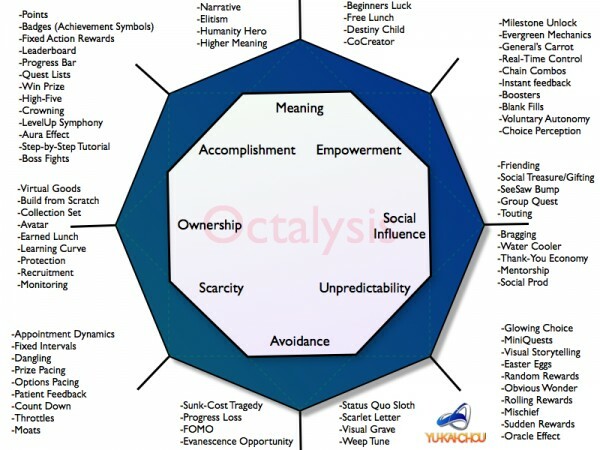 He arranges the groups of similar techniques in an octogon shape where the things on the left are 'left-brained' optimiser-related extrinsic motivators such as leveling up and score boards, and the right side are more intrinsic-motivation related things such as social interaction. The top groupings are 'white-hat' techniques that appeal to positive things such as creativity, story-telling and life meaning. The bottom groupings are 'black-hat' techniques that I think are really interesting such as scarcity, fear of missing out and gambling-related lucky or unpredictable events. The author describes his approach as being human-focused rather than function-focused design. Coders are probably too function-focused most of the time. I think this is the reason why I struggle to achieve that elusive fun factor in my game ideas. It's funny how making the game harder to play makes people want to play it more. "It's funny how depriving you of something that you want, makes you want it even more." And welcome to lesson #1 in sociology/psychology/life. Coders are probably too function-focused most of the time. I totally agree. If anyone does other kinds of software development (not just games) at some point they'll realize that software development is soooo much more about people and trying to understand what they want (how they perceive things, what it is that motivates change) as it is about mastering technology. It's just that we grow with the technology side of programming (in school throughout university). Then we slowly become good at it and finding pleasure in solving even the most intricate algorithmic problems and develop a tendency to only see the technology problems in software, of which there are actually not much. Because actually the "people" factors are much bigger. But having grown up with mastering technology we have at times the tendency to fallback to technology when being faced with an actual people problem and try to solve it with technology. And what makes things worse is that those people factors are given less attention and are hardly ever tackled. But I think they must be experienced to be understood. And it is even more delicate with game development as opposed to let's say enterprise software whose sole purpose is helping a company execute its business processes and supporting people allocated to those processes to do their work. What is the motivation for games? With enterprise software it's always: "Find some task in a business process that you want to have supported with software." Well, there the most difficult thing actually lies in identifying the business processes and the way how people work. Software development and specifically game development touches soooo many topics that are not at all related to technology or "computer science." I think that is one reason why game development is such an interesting thing to do. Regarding the categorization about motivation factors in games, I think that isolating and describing any such factor on its own is good to identify them but does not help very much. Abstracting the properties of a game so much by only giving those properties "names" and not accounting for how well they are actually realized and integrated with each other, does not help either. What life taught us is that everything depends on everything else and nothing is abstractable, because every abstraction loses important essence of the problem. How good will a game be if it only had 30 of the maybe 100 properties? Will it be "half as good" as one that had 60 of those 100 properties? The problem is that we as computer scientists always try to find some kind of pattern or system of categorization for very complex things by applying abstraction and composition in the hope that this makes the problem easier to comprehend. But from what I observed over the years that simply does not work with human behaviour. Now this post became a lot longer than I envisioned it to be in the beginning. Haha, very true. Here's another one that I've often heard: "treat them mean to keep them keen". Yes, that's a good point. I tried to think of a successful game that was very simple and only used one technique and naturally thought of Flappy Bird, so I looked up Yu-kai's assessment of it and he too acknowledges that this game makes use of mainly just one technique; scarcity and impatience to achieve a reasonable score. I expect that some of these concepts are explored by the author of that site in his book, judging by the title 'Beyond Points, Badges, and Leaderboards', but I haven't read it. For feature-focused coders who can only think in terms of structures and logic, this classification of the human-focused techniques is certainly interesting. Because actually the "people" factors are much bigger. But having grown up with mastering technology we have at times the tendency to fallback to technology when being faced with an actual people problem and try to solve it with technology. About trying to figure out the people problems, I think that's something that the marketing professionals also struggle with as much as us coders do. It reminds me of a quote by Henry Ford, who said "If I had asked people what they wanted, they would have said faster horses". Accomplishment - Badges, rankings and medal leaderboards. Higher meaning - People give advice, share code and make countless tools and API's for others to use for free, partly because everyone wants to contribute to something bigger than themselves. Friending and bragging - Showing off your latest project is always fun. And the social aspect of this forum is great. FOMO - Need to check into JGO every day or else there might be an interesting conversation that you missed. Also, topics are locked after a time so there's some urgency to post a message sooner rather than later. Dangling - New post messages at top of html page when someone posts something. A great addition! Don't forget the activation-quiz, that fuels 'elitism' for the newbies and 'high five' for everybody else. Occasional 'boss fights' with more experienced JGO members, haha. A funny video about unethical game design black hat techniques. Wow! That's Junglist! He was the main reason I watched Good Game on the ABC. Will watch the rest (if any) when I get home. Lol, he's a great presenter. I enjoyed the video too. His comments about MMOs are hilarious.